4-Color Process (4CP): Price includes a FREE 4-color process imprint on a white 50 sheet non-adhesive pad. To add a FREE stock background, please be sure to specify the background name on your order. Full bleeds available. 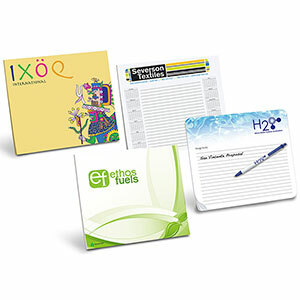 Imprint 1: 8 1/2" x 7 1/4"
Orders must be placed in 100-piece increments. Orders placed after June 1st 2014 for the â€œCalendar & Ruled Linesâ€� stock background will default to 2015 calendars unless otherwise specified. Please specify square or rounded corners. If not specified, square corners will be used.